When I first moved to Nashville, I took a job that I knew in my gut was a mistake, even as I was taking it. I was leaving another job that was a mistake. Which I took because I was getting married in eight months, and I needed a job to pay bills. But anyway, this job. It was heavy paper pushing and documentation and contracts processing, and what not. and I was terrible at that. There were a handful of things that the job required that I was actually quite good at. And those, I worked hard at and excelled in. But that was 10% of the job. And even if I was a superstar on that 10%, I was a goat 90% of the time. The people there were a mix. I loved the Nashville based co-owner and her husband. A gentle, kind couple who liked me and were friendly to me. My first friend in Nashville was an older woman I met there - we bonded over Project Runway and politics. We still bond over those two things. And then there were a handful of women my age with young kids, who didn't get me or like me. And then there was a handful of younger single girls, who didn't get me. There was a second co-owner out of Texas who hated me. She liked to talk about religion, and was openly hostile to me for suggesting that was a heavy topic for lunch time. I lasted about a year and a half. I cried on my lunch breaks, out in my car. I felt sick to my stomach on the drive in. I would stop at the Tiger Mart near the office to get a diet Coke, or an Oatmeal Creme Pie because the sweet woman working the register called me "Ladybug", and that was about the only kindness I'd get. Early on in my time there, I found a coping mechanism. 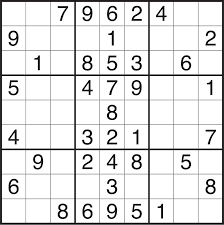 And that was Sudoku. From a website online, I'd print a page of puzzles - four of them. And I'd hide that under my paperwork, and when I felt overwhelmed or like I was failing, or I got dinged on forgetting something, I would slip out the paper and work the puzzle a little. And I'd feel a little better and I'd work some more. Puzzle, contracts, puzzle, phone call... I'd reward myself with Sudoku. About a year into my time there, my team lead - an angry little woman on a power trip, found one of my puzzles in my papers, and she laid into me about how lucky I was that she wasn't sharing this with the owners of the company, as they would be furious. I lied. I told her I did them on my lunch breaks. Whether she believed me or not, I don't know. I stopped printing the puzzles, and I stepped up my crying schedule to fill that void. In addition to the lunch breaks, I'd occasionally go cry in the bathroom, or even occasionally just a little at my desk. Every Friday, I marveled that I was still employed. Every Sunday, I felt sick. On my way into work, I made up a ritual that if I saw a bird on my drive in, it would be a good day. I always saw a bird, it was never a good day. It's been eight years since I was asked to leave this company. Well, I had the choice - quit or get fired. I opted to quit. It messed with me. In a big way. I felt broken and worthless and dumb. Then six weeks later, I started at my current job. I worked hard, I was good at what I was doing, and I stopped feeling terrified every time a door closed. But I didn't really pick up Sudoku again. It felt tainted. And what a shame, because I love it - I'm good at it, and it's a great time killer. Every now and again in the Southwest in-flight magazine, I'll noodle around with one, if I finish the crossword and need something to do. But, it just didn't feel authentic or pleasant. Yesterday, on the flight from Orlando to Nashville, I hit my stride. There were three crosswords - but I had tackled those on the flight down. Impressing my colleague greatly. So I started hitting the puzzles and by the time we landed, I'd successfully completed all of the warm-up and easy puzzles, and one medium one. And so, I do hereby declare, I am reclaiming Sudoku. But not at my desk. I'm already successful here. What an awful job that must have been, and so not deserving of you. I do Sudoku on my phone at work. I'm not very good at it, because numbers. I've often wondered if I'd be better at it if it were the letters A-I instead of the numbers 1-9.